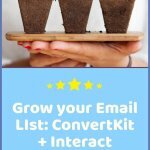 Growing Your Email List: ConvertKit + Interact | The Creative Entrepreneurs L.A.B. 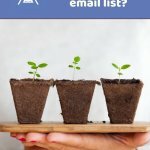 Growing your email list can feel like an uphill battle. You get five subscribers! You send an email newsletter – you lose seven subscribers. Get four new subscribers – lose eight on the next email. There’s just no winning the email marketing game! Okay, so that is (hopefully) a little dramatic, but we’ve all been there. It feels like you’ll never get ahead with your email list and you’re about ready to give up. Don’t despair yet! There’s a great email growth opportunity just waiting for you: opt-in quizzes. By creating a quiz, you’re giving your audience instant gratification (quiz results) PLUS further value through opting into your email list. Quizzes allow you to better qualify and segment your email list, too, since you can tag subscribers based on their answers within your quizzes. Want to learn how to do this? Read on, my friend. 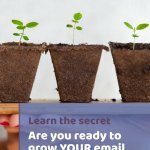 There are a lot of ways out there to grow your email list. Quizzes are by far my favorite, though! I don’t know about you, but creating PDF after PDF of opt-in freebies is just not my cup of tea. Quizzes, on the other hand, allow me to quickly target specific interests, engage a variety of audience segments, and NOT put hours and hours into it. If you’re unsure where to start with the content for your first quiz, check out this comprehensive opt-in quiz tutorial! 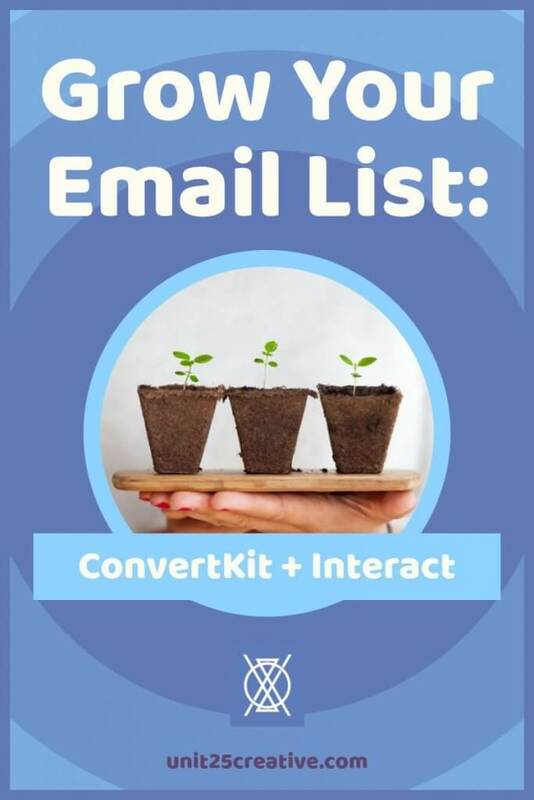 Once you have your quiz outlined, hop back over here to learn how to use Interact + ConvertKit to create a powerful engine for email list growth. Like I mentioned before, quizzes provide instant gratification. You’re trying to decide which CRM is right for your business? A list of features side-by-side for comparison is not going to be as powerful in the decision-making process as taking a quiz. Through a quiz, you can tap directly into someone’s preferences without biasing them as much towards a certain result. For example, in my Dubsado vs. 17hats quiz, I was able to not only ask text questions but also show various areas of the actual CRM interfaces and allow the quiz taker to choose which one appeals to them more. By engaging multiple senses, the quiz taker is more engaged and can immediately see the value you’re providing them. Through a simple quiz, you may be able to answer a question that has been nagging at them for months! Quizzes also give you the chance to get a deeper look into your subscribers’ motivations and needs. Since you can tag quiz takes in Interact based on their answer to specific questions (more on that in a moment! ), if one of your quiz questions indicates to you that someone is ready for one of your services or products, you could tag them in ConvertKit so you know to include them in your next campaign. Having this kind of engagement and in-depth view of your subscribers can change your entire approach to email marketing AND help you deliver top-tier customer service! 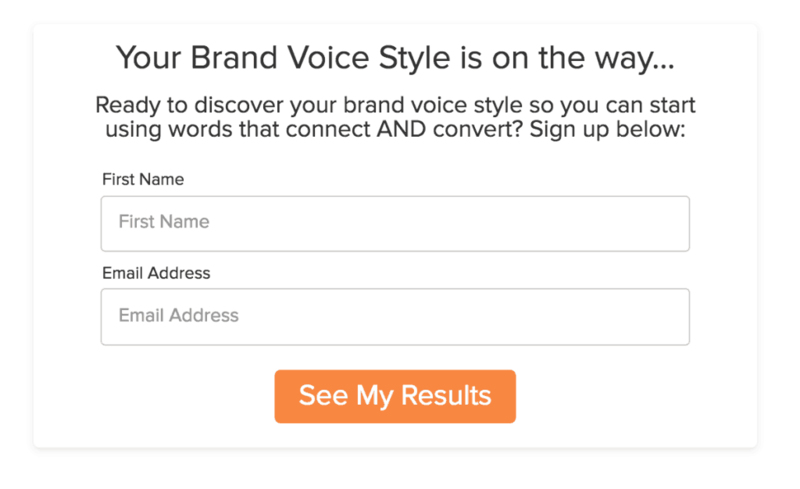 First things first: you need to create a signature opt-in quiz. Yes, you can create blog post-specific and even page-specific quizzes, but if you want to grow your core audience, a signature opt-in quiz is key. This gets your subscribers in on the ground floor and welcomes them into your brand. 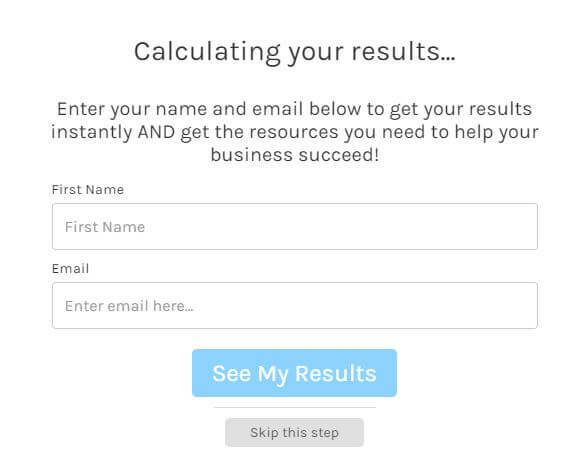 Since Interact lets you choose a quiz to use as an announcement bar (think Hello Bar) and/or a popup (like so many of us use for regular email list opt-ins), this becomes the first quiz many of your website visitors will see and… well, interact with! This is where things get strategic. Interact advises that you allow quiz takers to skip the opt-in step, but that’s also obviously pretty much the entire POINT of creating an opt-in quiz, right? So what do you do? I typically leave the opt-in skip option turned on. If someone doesn’t want to receive the content I provide, they won’t be a quality lead anyways. Just let them get their results and move on. However, I also want to show the value that my email list offers and encourage them to opt-in. 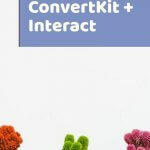 Back to integrating ConvertKit with your Interact quiz! 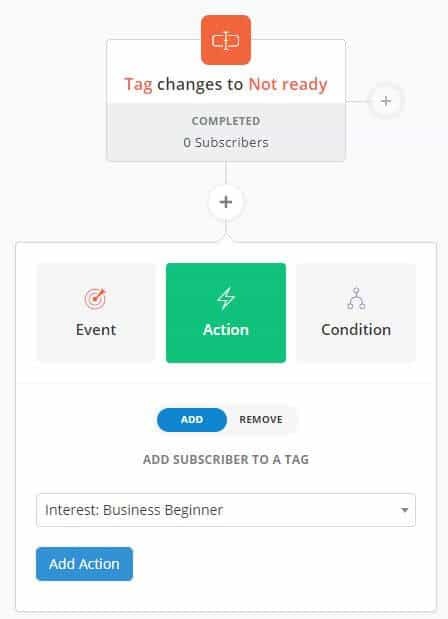 Once you’ve hit Save & Continue after designing your quiz opt-in form, Interact will walk you through all of the steps to connect ConvertKit to your quiz. You’ll need to get your ConvertKit API key and API secret (don’t ask me why it’s called that), but it’s not hard to get those. (Just go to your ConvertKit account settings and your API key and API secret information is on that first page.) 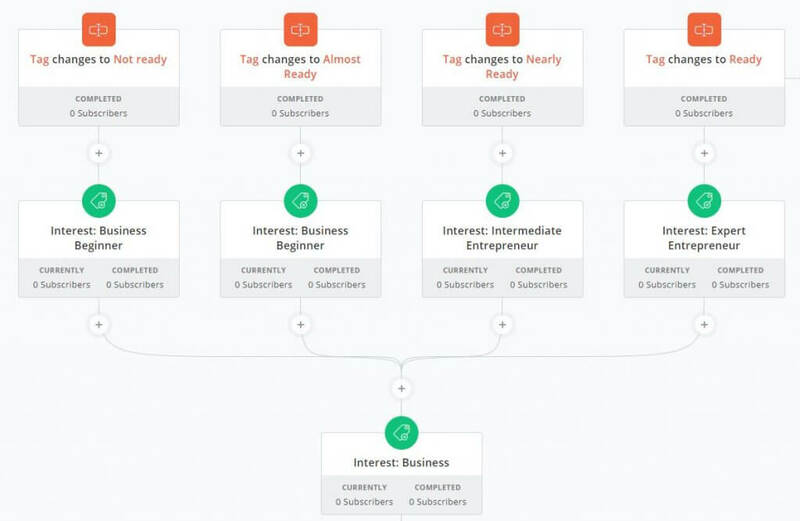 Once you’ve connected ConvertKit with your Interact quiz, you’ll be able to map the quiz results and even individual questions to different actions within your ConvertKit account! This is where ConvertKit + Interact gets a little tricky. You can add the quiz taker to a ConvertKit sequence or form, or you can update a custom field in their ConvertKit subscriber profile. You can’t directly assign a tag to someone like you would within ConvertKit, though. I spoke with Jessmyn, one of the great gals who works at Interact about why you can’t just assign a tag within ConvertKit. She told me that the ConvertKit API is set up a bit different from something like ActiveCampaign’s tagging system, so it isn’t a direct integration. Luckily, I’ve found a way around it! Just keep reading. As you can see, I’ve already added a custom field (ConvertKit normally just has First and Last Name and Email Address). 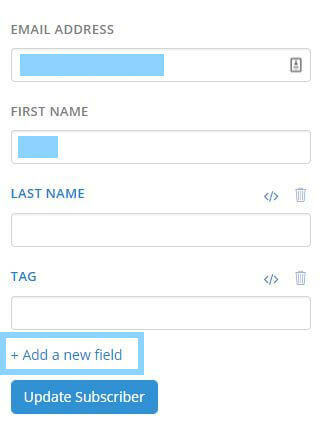 To create your own field, you’ll want to click the + Add a new field button (the one I highlighted above). Type in the Field Name (this is what shows up on the ConvertKit side) as well as the Field Value (what shows up in Interact). In this case, I just named it Tag and gave it a value of tag. Nice and simple. If the new field doesn’t show up, save your quiz and open it back up. It should be there now. Add the Update Subscriber Field action for each and every quiz result and/or question that you want to be able to tag in ConvertKit. You can change the value, too; for example, one of my quizzes has a result titled “Booyah – you’re ready!” which is a bit unwieldy for our tagging purposes. I changed the field value in Interact to be “Ready” to make it easier to work with on the back end. Use whatever wording works for you! 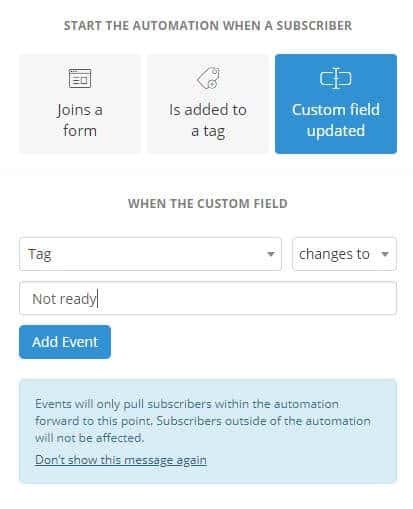 This means that whenever Interact updates that particular custom field based on a quiz taker’s response, ConvertKit will automatically do the action we’re about to set up. And that’s all there is to it! It may seem a little complicated at first glance, but once you complete the steps and understand what you’re doing, it’s not too hard. As you can see, ConvertKit and Interact combined can make for a superhero-level email marketing and lead generation system! Don’t forget to have a great email sequence to send to your new subscribers, packed with value for them to munch on. If you need help creating your quiz or email sequence, let us know – we’re happy to help! 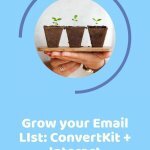 Have any questions or thoughts about using ConvertKit + Interact to grow your email list? Share with us in the comments!